Dylan is now 9 months old! In the beginning I was ranting about how I want him to grow up faster, but now, well, I still wish he’d sleep better, but he’s such a character and so darn cute, I really need to capture these fleeting moments before they just fly by! I wrote the same milestone post for Danielle here, so it’s only fair that I write one for Dylan too. 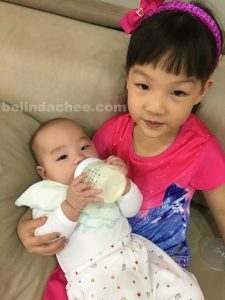 As a parent, I know that every child grows at their own pace, but as child number 2, I can’t help but compare Dylan to his sister and so far, he’s been one up-ping his sister in most major milestones. I guess in my children’s case, what I’ve read is true, boys pick up gross motor skills faster, but when it comes to fine motor skills, girls are better. Warning: lots of pictures ahead!! Sunbathing in just my diaper! Dylan had prolonged jaundice which lasted till he was about 2 weeks old. His readings were borderline when we got discharged from the hospital, but 3 days after, when we went back to do a blood test, it has shot up! So, we had to rent a Billi-blanket and wrapped him in it at home for almost 24 hours for 5 days straight. After that, his jaundice slowly dissipated. 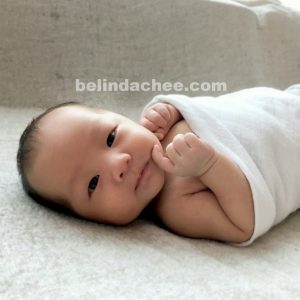 All throughout, we had thought that maybe he was really uncomfortable in the blanket, therefore, he would cry and cry and cry. If he was not asleep, or drinking milk, he was crying! And usually at about 8pm till about midnight, he will scream and cry till he was red in the face and almost hoarse! No matter what we did – carried him, rocked him, pacifier, milk, upright hold, football hold – it didn’t calm him, he was inconsolable! Mummy was art director and photographer! Not bad right? 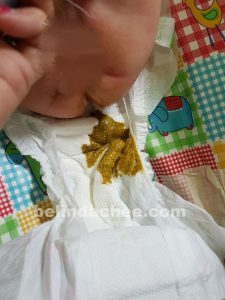 The paediatrician diagnosed him with Colic and we were given colic drops. We gave him gripe water as well – sometimes it worked, sometimes it didn’t. The thing about Colic that I have learnt is that it is not all just ‘wind’ in the stomach like most older people would say. It might be because his digestive systems are still developing, therefore he gets cramps; it might be the hormones still stabilising, and that wrecks havoc in his little body (I should know after going through postpartum anxiety) or perhaps he’s just sensing my anxious vibe and reverberating it back. Even the paed said that there’s no way to pin-point a cause and there’s no miracle cure. We just have to ride it out! Whatever it was, it was a difficult time. And almost every night without fail, he would start his crying spells and we’d pass him around between myself, the nanny, my maid, my mum and my husband, until he falls asleep, mostly from exhaustion. How much he has grown in just 3 weeks! 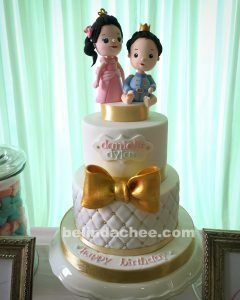 We celebrated Dani’s 5th birthday together with Dylan’s full month party when he was 6 weeks old. 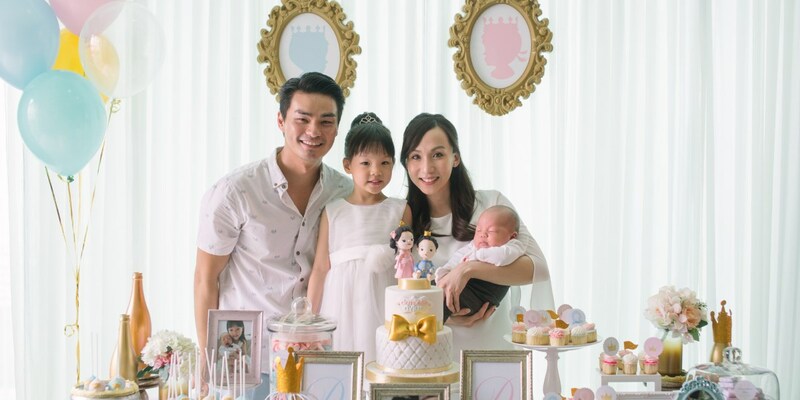 ‘Ang Ang’ for the first day of CNY as a family of 4! The inconsolable crying miraculously went away almost overnight after Dylan passed 100 days!! 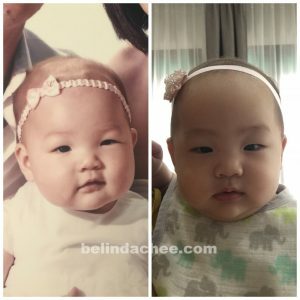 Now I had a totally different baby! He would coo and smile, loves to listen to me sing, loves just looking at his sister doing her dance or gymnastic routines. He’s contented just gnawing on his chew toy while the world goes on around him. And night time was not such a nightmare anymore. He would even sleep up to 6 hours straight some nights! But naps were still a struggle. Like his sister, he’d only go down for 30 minutes naps most days so we’d have to put him to nap a lot of times a day and putting him to nap will almost always take longer than 30 minutes! First trip to Club Med Cherating! We were even brave enough by then to take him on a trip to Club Med Cherating. 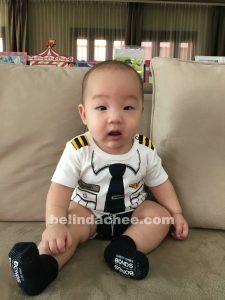 We took Dani to Club Med Bintan when she was 3 months old as well, but comparatively, Dani was the better traveller. You can tell that he was really uneasy with the change in environment. He still preferred the comforts of home and was so happy when we put him in his own bed that night. Tummy time! Which he hates!! 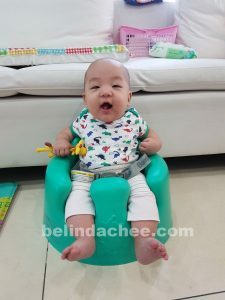 Able to sit on the Bumbo for a while and has a strong grip! I guess Dylan was a more serious baby compared to his sister because he only started laughing out loud at 4 months. Dani was laughing from 3 months. But, he managed to turn from his back to his front at 4 months as compared to Dani who only managed to do it at 5 months. But I have to say, as soon as the inconsolable crying stopped, the brother/sister relationship also became better. Dani was now very happy to hang out and help me with her baby brother. She is very good with him, and he loves staring at her. Once when I was unwell, she brought me a blanket and asked me to rest. She even asked her Kakak to take a break as well and she pushed him around the house in the stroller, spoke and sang to him, wiped his drool with a hanky and entertained him for a good half an hour before pushing him back to Kakak. I am really very proud of what a good girl my firstborn has grown up to be and I trust she’s going to be a great big sister. Check out my B-Boy Moves! We hit a road bump this month as Dylan started becoming constipated. 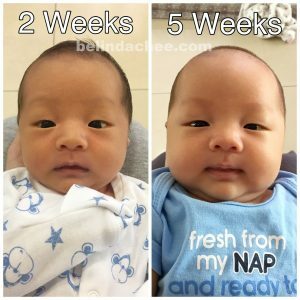 He’d only go every 2-3 days and once, he went up to 6 days without pooping! 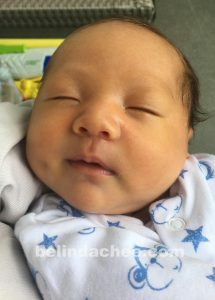 He was otherwise normal – happy, drank his milk, slept as usual, no signs of stomach discomfort, or bloated tummy. And we hadn’t changed his formula or added anything unusual to his diet so it was really odd. I brought him to see a paed, and she said he’s still a little too young for laxatives, and because he is formula fed, the chances of him getting constipated is higher. She prescribed him with liquid probiotics and asked me to feed him some glucose water. 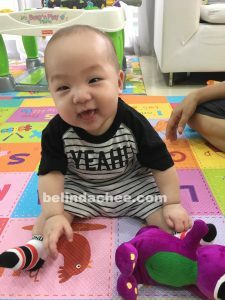 She also encouraged me to start solids soon because she suspect he might not be getting enough just from milk alone – everything is absorbed by his body so not enough waste to push out. Yeah!! I get to eat Semi-Solids soon! 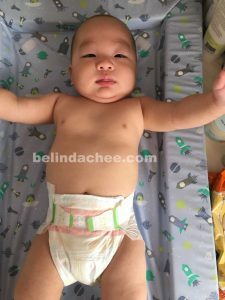 We started giving him the liquid probiotics daily, and when he is really constipated, a tablespoon of prune juice diluted in water and that got the bowels going! He’s been quite regular since then so I guess it worked. He also loves to drink water now so that helps as well I guess. At this stage, I’m also seeing signs that he might turn out to be a left-hander. Every time I pass him a toy to his right hand, he’ll grab it and always pass it over to his left. And he generally reaches his left hand out first to rake toys or grab at things. We shall see in due time if Mummy’s theory is right! At this stage, he had started on semi-solids – just vegetable and fruit purees once a day. The first time you give him anything new, he’ll always cringe and make a face, but he will finish the purees anyway. We started with root vegetables – pumpkin, sweet potato, carrots – because they had more fibre and will help with his bowel movements. Rice cereal has very little fibre so it’s not the best ‘first food’ choice to give to a baby prone to constipation. He started Belly/Army crawling as well! Very quick compared to his sister, who actually didn’t really crawl. Now that he can crawl and get around, he gets very upset when you put him in the jumperoo or in his Bumbo seat. Do I look like Che Che? 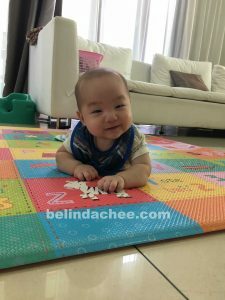 Although he’s quick with these gross motor skills milestones, he doesn’t like to put both his hands together to clap or to bang things together like his sister did at this age, and he rarely brings his toes to his mouth. The best way to keep him entertained at this stage is to put him in his walker and let him scoot around while biting on a teething rusk. Merries diapers from Day 1! I’m glad that throughout this growing up journey with Dylan, although there are ups and downs, one thing has remained constant and that is Merries diapers. I had used another Japanese diaper brand for Dani but after a couple of friends told me about Merries diapers’ superior quality I decided to give it a try and I’ve not turned back since! The quality is unbeatable, it is definitely the softest diapers I’ve ever felt – inside and outside. I’ve pee-d this much, Mummy!! There is a wetness indicator to tell you when it is time for a diaper change. Sorry gross poo pic! But very little mess on the bum as you can see!! And with it’s fast absorption, even with soft poo, moisture from the poo is absorbed almost instantly, which means that there is less mess on the bum! Definitely thumbs up! I’m glad that I made the switch and I’ve decided that Merries will continue to join us in this growing up journey until we are able to go diaper free!